One week until Mardi Gras! The countdown is on! Whether you observe Lent or not, Mardi Gras is a really fun excuse to make some indulgent dishes – and these cinnamon rolls definitely fit the bill. 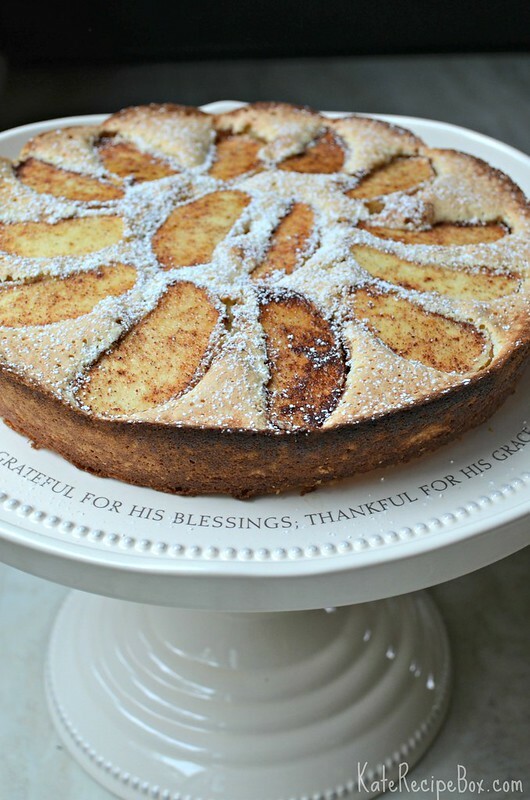 I’m wrapping up #appleweek today with the simplest dish of the week – and my personal favorite. One of the things I’ve learned over the years is that while the over-the-top, super involved recipes can be really fun, simple recipes with great ingredients are often just as good – if not better. This cake falls into the super simple category. The whole thing takes just about 10 minutes to prep, and instead of something super polished, it’s got the rustic beauty thing going for it. And honestly, it’s delicious. 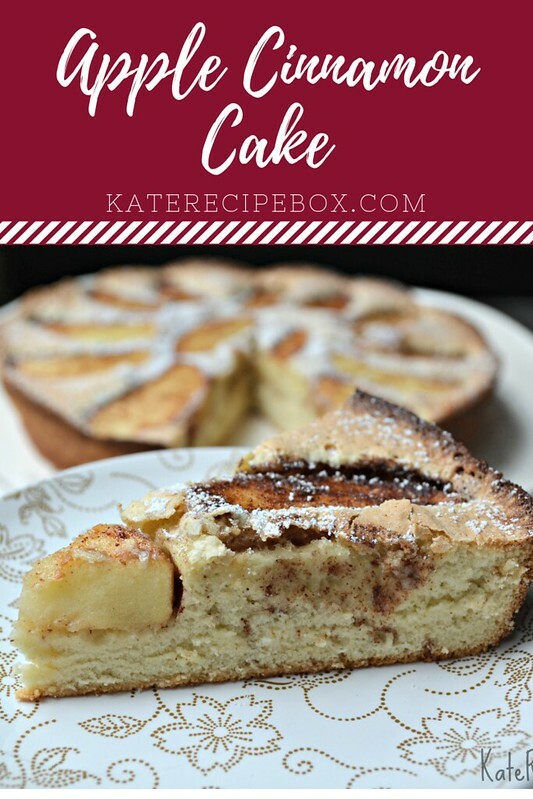 This is the perfect cake to pair with a hot cup or tea or coffee, a book, and some of this crisp fall air. Who wants a slice? Preheat the oven 350 degrees F. Grease and flour a 9″ baking pan and set aside. Peel, core, and slice the apple. In a bowl, toss the apple slices with 2 Tbsp. sugar, cinnamon, and nutmeg, until evenly coated. Using an electric mixer, beat together the eggs, flour, sugar, and vanilla until fluffy. Pour the batter into the prepared pan. Arrange the cinnamon-sugar coated apple slices on top, pushing them down just slightly. Bake for 30-35 minutes, until a toothpick inserted in the middle comes out clean. Cool for several minutes, then remove from the pan and dust with powdered sugar. 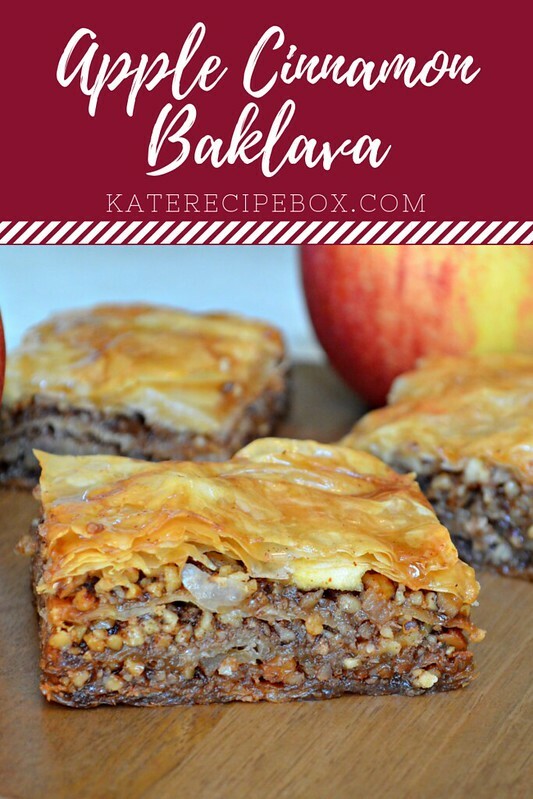 Baklava has been on my baking bucket list for so, so long. It’s one of those dishes that I love to get when we’re out, but I always assumed it would be hard to make. I was wrong. A little time consuming? Maybe. But not hard. 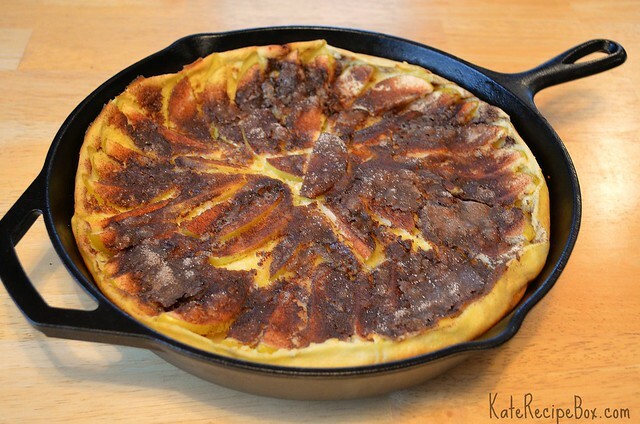 This version is fall-perfect with apple chunks in the layers and apple cider in the syrup. 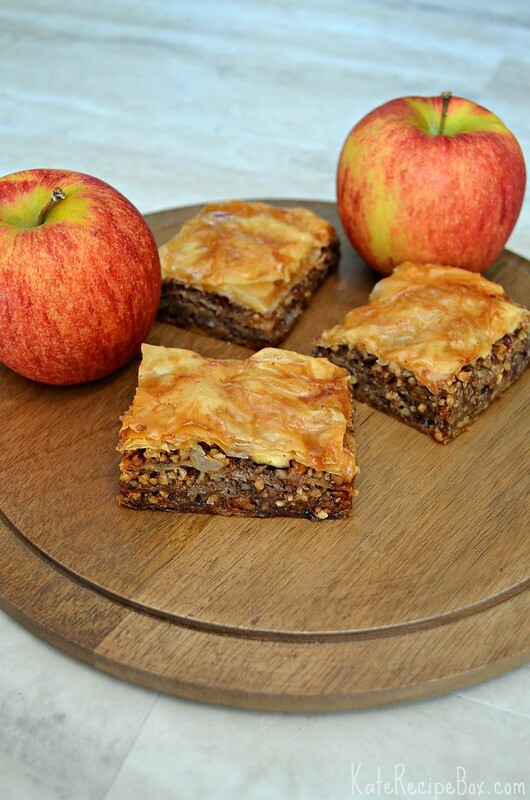 I used apples from #appleweek sponsor Envy Apples in these. This was my first experience with Envy, but they’re definitely an apple that I’ll seek out now. They’re perfectly delicious eaten on their own, but they were also fantastic to bake with. 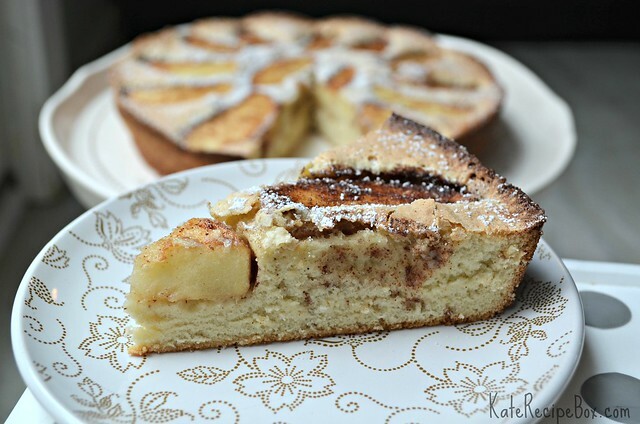 Every recipe I’ve posted this week using apples has been made with Envy Apples! 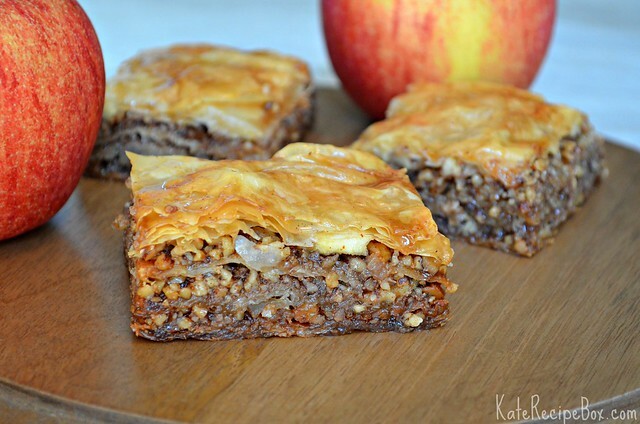 Here they hold the flavor and crunch perfectly so you get undeniably apple bites in the middle of this baklava. Spread out the chopped nuts on a baking sheet and bake for 5 minutes, until fragrant. Transfer the nuts to a food processor along with the brown sugar and 1 1/2 tsp. cinnamon. Pulse a few times until the nuts are chopped medium-fine and sugar is well incorporated. Set aside. Unroll the phyllo dough on the counter and cover with a damp tea towel to prevent it from drying out. Spread 1/3 of the nut mixture layer over the dough. Spread half of the apple over. Lay two sheets of dough on top of the apple- nut mixture and brush with butter. Lay two more sheets of dough over and brush with butter. Lay another two sheets over and brush with butter. Spread 1/3 of the nut mixture layer over the dough. Lay two sheets of dough on top of the nut mixture and brush with butter. Lay two more sheets of dough over and brush with butter. Lay another two sheets over and brush with butter. Using a sharp knife, cut into slices in a diagonal pattern. Bake for 45 minutes, until golden. While it bakes, combine the remaining ingredients in a small saucepan and bring to a boil. Reduce heat and simmer until it’s reduced to half. When the baklava is baked, pour half of the syrup over. Let it sit for about 15 minutes, then pour some more over until fully absorbed. Hey guys, I’m pregnant! I realized after the last post I never actually said it here – but it sure does explain the lack of posts recently, right? One thing I’ve been loving this pregnancy is breakfast. Anything breakfast-y. Pancakes for dinner? Bagel sandwiches? Brunch whenever I can? Yes, yes and yes. I found some really nice apples in the store a few weeks ago and whipped this up one weekend morning. It was delicious. 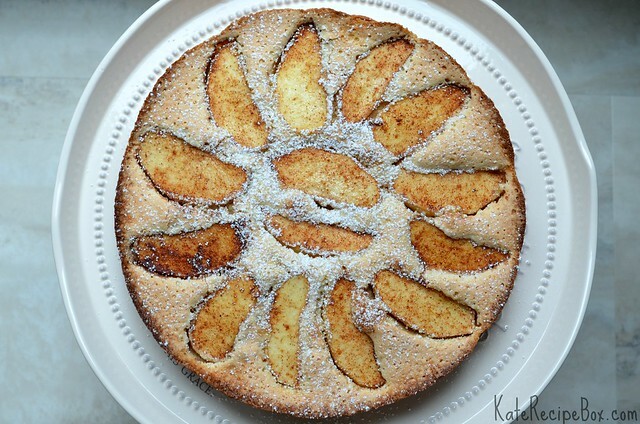 I can’t wait to make this again in the fall with some fresh-from-the-farm apples! Preheat the oven to 400F degrees. Place the butter in an oven-proof skillet and put in the oven until melted. Meanwhile, whisk together the flour, baking powder, 1 Tbsp. sugar, salt, milk and eggs in a medium bowl. In another bowl, mix together the 1/2 cup sugar and cinnamon. Once the butter is melted, arrange the apples in the pan. 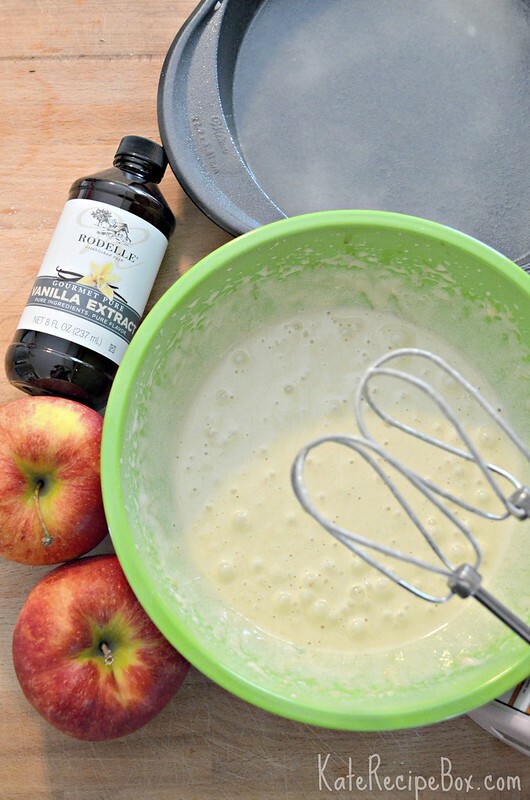 Pour the batter over the apples. Sprinkle the cinnamon sugar mixture evenly over the batter. Bake for 20-25 minutes, until golden brown and nicely puffed up.